Color Me Happy...: Life is Sweet! Yep life is sweet and one of the main reasons is because we bought waaaay too much candy for Halloween! We had tons of trick or treaters last year but this year...not so much. We now have oodles of candy and just Joe and I in the house. So, I decided to make up Halloween gift bags to mail to my three kids and the "boyfriend", as well as one to my little second grade lunch buddy and then finally to the people who I "chemo angel". I have two people that I am chemo angeling at the moment. Both have just been assigned to me last week so this will be my first "meeting" with them. And what better way to meet new folks than with a sack of candy right???? In the bios that I was given one person has young children and the other has grandchildren so I thought that both could share these Halloween goodies with their family! This first bag is the one that I made for my little lunch buddy. I used a regular gift bag for this one and I like to go all out for her as she gets so excited! and these are the next size up. 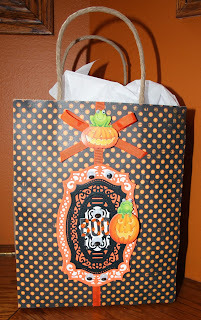 It is a nice little treat bag to have around and can be filled with quite a bit. Thank you for stopping by today and for leaving me such nice comments the other day on my jewerly boxes. I have a couple more that I am working on and when they are finished I hope to post them. I am discovering a whole new world of "modpodge" items....or rather items that can be modpodged! It has been fun to try other paper crafts and I am enjoying stretching my products (and using up tons of hoarded paper.....) and trying new things. Love them all, Sheila! Adorable treat bags! So cute! We don't give out the candy until Thursday. Hope I don't have too much left. You are ahead in WI! What a great idea for the leftovers, Sheila! I hate having a bag of candy around; it is way to tempting! great bags Sheila. I'm expecting a few ghouls and witches to call into tomorrow night and have a few bags of sweets ready. What fun bags, Sheila - and each has its own personality. I'm partial to pumpkins, so those are my favorites. But I don't get it - you have already had trick-or-treaters? Isn't that jumping the gun? So glad that you are sharing your yummies! WOW!! Sheila!! You have been really busy since I last came to visit. 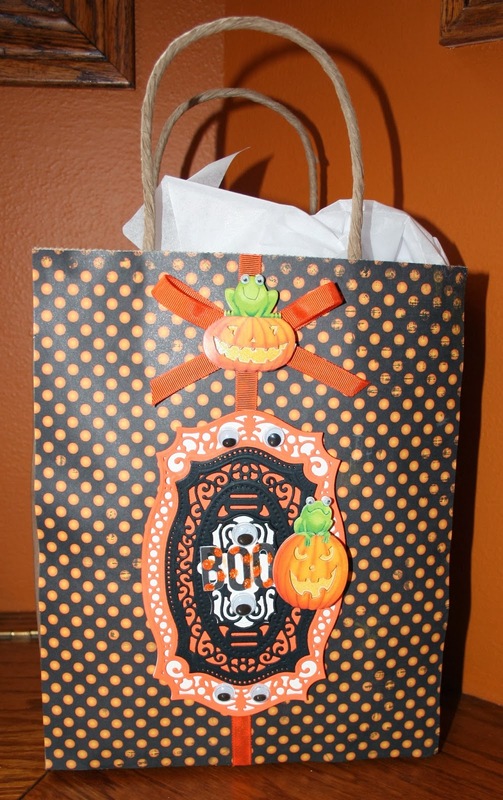 Your treat bags are fabulous! Lots of other beautiful creations, too! I love your altered advent calendars.....so colourful and clever.